rebecca likes nails: Yet Another Bundle Monster Contest! This time around, I'm looking for another win! I can't wait to get my hands on their upcoming set of plates, and winning them would make them even better! Here's the mani that I came up with for this year's contest. This mani kept evolving as I was doing it! It turned out very different from what I had planned but I think it definitely went in the right direction. The white stamping you see was done with BM-201. The black stamping is from BM06. Originally the white was going to be black, and I was gonna stop there, but I'm so happy I decided to go for white stamping and the accent stamps! You're probably wondering what all the technicolor goodness is behind the stamping! Well, it's magic. So I can't reveal my tricks. Just kidding! I'll let you in on the magic. I did the watercolor technique using all six colors from the Color Club Take Wing Collection. I've done a tutorial on the watercolor effect, click here to see it! Quick refresher - the watercolor technique is done with a semi-fluffy soft brush and acetone. You start with a white (or light) base that you've topcoated and let dry completely. You add on small dots of color, and immediately blob them around with your soft brush that's been dipped in acetone. Like I said, check the tutorial for a more in-depth tutorial and pictures! I was so happy with how the colors looked in the watercolor, but I think adding that stamp really set it off. At first I was gonna submit it like this, without the accent stamps, but I decided to go for it and make my mani that much more interesting! I love my mani. And I hope you do too! The voting process is very simple, you just go to the specific entry and click the big VOTE button! You can vote once per day all throughout the week. If you voted for me, thank you! 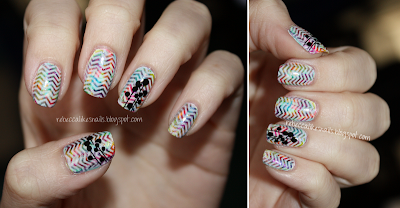 And be sure to check out all the contest manis because there are some beauties in there! I'll be voting for you every day this week for sure! Go Rebecca! I hope you win! I hope you win too, jeeeze this is soooo awesome!!! OMG this is just super stunning Rebecca! You have my votes! Normally I'm not a huge fan of the watercolor effect, but I love it with the stamping over it! Great job! omg gorgeous. I can't wait to try water colouring with the Color Clubs! This is honestly so pretty! Definitely voting for you!! This is amazing! Good luck. Wow! Your nails look amazing!! I voted for you. I love everything about this mani! So gorgeous! Thanks for your blog, it´s very interesting.